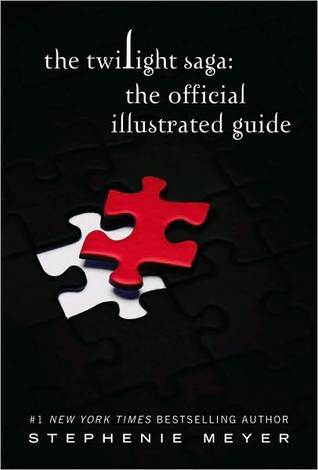 The Twilight Saga: The Official Illustrated Guide (hereinafter "the Guide") was released today. I have been looking forward to this for almost three years. Today felt like Christmas in April. I even took a half day at work so I could have plenty of time to digest the Guide. After a lunchtime yoga class and a trip to Target, I was happily ensconced in an armchair at my favorite coffeeshop with a cup of hot chocolate. There I remained for the next four hours, until I finished the Guide. I am evenly split between happiness and disappointment. There were so many wonderful bits of information in the Guide, things I never thought to wonder about and answers to numerous niggling questions. However, so many things were left out - things that I'm sure Stephenie knows and are really essential pieces of information for any Twilight lover. On the bright side, the paucity of information means there's lots left to the imagination. Readers and writers of Twilight fan-fiction will not lack for story options. I also wonder if the major holes in various characters' biographies (specifically Alice and Jasper, as well as Renesmee and Jacob) were done in purpose to leave room for future books. I already know that she won't answer certain questions about Nessie and Jacob in case she explores it later, but there was so much left out of Alice and Jasper's early lives that perhaps Stephenie envisions another story (I doubt it though). I'll go over the good and bad points. I am making an effort not to put any spoilers in my review (e.g. the substance of Alice's story), but I'll be referring to what is and is not in the Guide. If you're as picky about spoilers as I am, you might want to be careful. Also, given the level of my emotional investment obsession in Twilight, my criticisms will likely not be as diplomatic as I normally try to make them. 1. Vampires Generally: I learned almost everything I wanted to know about the physical qualities of vampires. I already knew much of the information, but there was just enough new to keep me happy. 2. Alice's Human Life: Brava, Stephenie! You told me everything I wanted to know and so much more. Alice's human life was fascinating from beginning to end, although not in a good way. In some ways, it's better that Alice doesn't remember any of it. One of the highlights of the Guide. 3. Edward's Life: Not entirely complete, but I loved learning more about Edward's relationship with his parents, particularly his father. I already knew that his father was an attorney and they were fairly wealthy, but I loved filling in the gaps in Edward's story. It was also fabulous to learn what degrees Edward has received over the years. I was happy to get a little more information about Edward's years as a traditional vampire: specific dates and one tidbit I'd always wondered about. 4. Other Vampire Biographies: While I was largely disappointed with the new information, or lack thereof, in the Cullen's stories, I was beyond impressed with the biographies of the Volturi, the Denalis, the Romanians, the Egyptians, the Amazons, and the Nomads. There was tons of information here, all new. We get detailed biographies of each major character's human and vampire life. The Guide was worth buying for these stories alone. They were the highlight of the entire book. -The Volturi: From the books and the Twilight Lexicon, we already knew a little background about the Volturi, but the Guide tells us so much more. Detailed histories of Aro, Marcus, and Caius which give us insight not only to specific events of their lives, but also to their personalities and motivations. I was so happy to learn about Alec and Jane's histories. Chelsea's biography was much more interesting than I expected it to be. The way the Volturi's motivations for ruling and claiming themselves as keeper of the law was skewed; I think Stephenie would root for a vampire coux. -The Romanians and Egyptians: I'm combining these categories, because they are both ancient covens. I loved learning about how millennia of ambition and warfare built these covens and tore them apart. Amun's story was particularly interesting, especially how he has interacted or hidden from the Volturi over the years. -The Denali's: There wasn't a huge amount of new information here, but the sisters' stories were fleshed out. I was very happy to get a better idea of when the Cullens' first met the Denali's. -James and Victoria: Fabulous. Especially Victoria's stories. I don't like either character any better after knowing their backgrounds (if anything, I like James even less), but I definitely understand them better. Victoria's human life and then how her talent for escape worked as a vampire was really interesting. -Alistair: Perhaps the most fascinating story of all. I really wanted to know more about Alistair and Stephenie did not disappoint. It would be hard to top the betrayal and horror of Alistair's transformation into a vampire. I was also happy to learn how Carlisle and Alistair became acquainted. It could have been fleshed out a little better, but I was still happy. -Peter and Charlotte: We learn more details about Peter and Charlotte's escape from Jasper and Maria and Peter's return for Jasper. We also get excellent insight into Charlotte's character and feelings for Jasper and Alice. Through Peter and Charlotte's stories, we learn a lot of new information about Jasper. I would have liked a better explanation of why Peter and Jasper got along so well as well as information about Peter and Charlotte's human lives, but the amount of new information made up for what was lacking. -Makenna: Makenna is a nomadic vampire I barely remember from the books. However, her story is fascinating. The circumstances under which she became a vampire were unique in the Twilight world. It was something I thought wouldn't happen in Stephenie's vampire mythology. The story was interesting and well done. -Joham: Tons of information about Joham. His motivations, his relationship with his children, his selfishness and cruelty. I also enjoyed getting to know a little about his children. 5. The Wolves: I've made it pretty clear that I'm not nearly as interested in the Wolfpack as I am in vampires. Still, I found a lot of the information about the wolves fascinating. -General Mythology: I loved learning more about "real" werewolves versus the Quileute shape-shifters. There was also good information about the physical attributes of the Wolfpack. I got a better understanding of their appearance and supernatural capabilities both in wolf and human form. -Billy's Story: I loved learning more about Billy. We learn about his knowledge of vampires and werewolf legends, his thoughts on being a missed wolf generation, and his feelings toward the Cullens. -Sam, Leah, and Emily: Now this is drama. From the books, we know the basics of how Sam dropped Leah when he imprinted on Emily. Here we learn exactly what happened - Leah's bitterness, Sam's regret, Emily's surprise. We learn just how Emily received her scars. Leah's story definitely makes me sympathize with her more. On a side note, we learn what triggered Harry's heart attack. Very interesting, although I think I like how the New Moon movie portrayed it better. 1. The Cullens' Stories: The lack of new information about the Cullens' in their bios was the biggest disappointment for me in the Guide. There were little tidbits I didn't know, but on the whole, their bios were just paraphrased from the books. I already know the biographical information in the books. What I want to know is what wasn't in the books. If the information didn't come from the books, it likely came from Stephenie's website or from the Lexicon interviews. I keep reading the same pages over and over in the hope that the letters on the page will magically rearrange themselves into new sentences. A huge, huge disappointment. 2. Alice's Vampire Life: As I said, I loved the story about Alice's human life. But there was virtually nothing about her life as a vampire prior to joining the Cullens. It's not like she found Jasper and the Cullens within the first couple of weeks of her new life. It took thirty years! A lot of things surely happened during that time period. What were they? 3. Esme's Story: What did she name her baby? Why, oh why wasn't this included? Such a simple piece of information that so many people want to know (or at least I do). Otherwise her story was fine. Nothing I didn't know from the Lexicon interviews, but interesting nonetheless. 4. Jasper's Story: I wanted to learn more about his human life. What was his family like? Was he in school prior to joining the army? Absolutely nothing about his vampire life that we don't know from Eclipse. His relationship with Maria was not adequately fleshed out. Nor do we learn much about his early years with Alice and the Cullens. Also, there is nothing about the scope of his power to manipulate emotions. Three of the things I most wanted to know. 5. Carlisle's Story: Not enough information. It was a rehash of what we already know from the books - practically word for word of what Edward and Carlisle told Bella in Twilight and New Moon. There were some interesting tidbits spread throughout the Guide, but not nearly enough. I wanted to know more about his human life and more about his early relationships with Edward (both before and after he turned him), Esme, and Rosalie. We didn't get a firm idea of when he started practicing medicine or just how hard it was training to handle blood. No idea where Carlisle learned to fight so well. 6. Edward's Story: I was largely satisfied with Edward's story. There was enough new information to make up for what was lacking. Or almost enough. I really wanted more information about how Edward, his mother, and Carlisle became close in the hospital. I wanted more information about Edward's first few years with Carlisle and Esme and whether he was initially resentful that Carlisle turned him. Also, I would have loved an outtake of Edward's prodigal son moment. 7. Rosalie and Emmett's Stories: There was virtually nothing new about Rosalie. I might as well have just re-read Eclipse. I wanted to know more details about how and when she kills Royce and his cronies. I was especially disappointed that I didn't get a better feeling of Rosalie's relationship with Carlisle. Emmett's bio did have new, interesting information, but not enough. What did he do as a human? Where did he work? It's interesting to know that he slipped often in his early years, but I want to know specific details. 8. J. Jenks' Story: We don't really get any new information about Jenks. I wanted to know specifically how Jasper terrified him so much. I would also love to know whether Bella can convince Jasper to let her handle that relationship post-Breaking Dawn. 9. Maria's Story: Sadly lacking. Unlike the other vampires, we learned nothing about Maria's human life. There was some new information in her bio, but not nearly enough. I wanted to know more about her relationship with Jasper. Also, I was disappointed that we didn't learn more about Maria's visit to the Cullens in Calgary and why they had to leave immediately. 10. Wolves Sleeping Around: We don't find out who Embry's father is. Come on, Steph! 12. Sloppy: I was extremely irritated with the mistakes in the timeline for Jasper, Peter, and Charlotte's lives. The Guide states that Peter's age ranges from 1860-1920. Two pages later, it says Peter was 3 years old when he ran away with Charlotte. If you follow Charlotte's bio which says she was turned in 1938, they left in 1939. However, the timeline later in the book says that Jasper left Maria in 1938. Hmmm...problem here. Even more mixed up, it specifically states in Eclipse, that Peter came back for him five years after he and Charlotte fled. Clearly someone dropped the ball here. I blame the Twilight Lexicon for this (who helped with the Guide). Their timeline wrongly states that Jasper left Maria in the last 1800s. From Eclipse and Midnight Sun, this is obviously incorrect. The screwed up dates carried over to the Guide. (To be fair, the Lexicon is no more to blame than Stephenie and her editors for this large error). A smaller error appears in Angela Weber and Ben Cheney's biographies. In Angela's, it states that they both plan to attend University of Washington. In Ben's, they are suddenly going to Washington State University. Two different schools. I have to admit, I wasn't interested in reading this at all until this review! Now I'm definitely curious. Loved reading your thoughts on it, Alison! Wow! I would learn so much from this book. It's been awhile since I read the books, so it would probably be a great resource to review for the last movies, too. You have really made me want to read this now! I have to say, I originally didn't think that I *needed* this book - but now you are making me think that I do. I'm also feeling like I might need to reread the series again! Great review and super detailed, thank you! I may have to pick this up. I wasn't sure until I read this review. I wasn't sure how much new information would be included so I am glad to see that some new material was included. I'm still on the front about picking up the Guide. After being thoroughly disappointed with Bree's story, I am hesitant about picking this one up and still am. I think I'll wait for my library to purchase it and then decide whether or not to include it in my TW Saga collection. Just a question about the timeline. Perhaps Peter's age conflict is his human life span and vampire life span? So I have no idea where the other dates come from. I'll pose the question on the forum board and see what the admins say. As a member of the Twilight Lexicon forum, I can assure you that all the information they received for the timeline has either been personal correspondence with Stephenie, interviews, and from the books themselves. I can't wait to pick up this book. I am disappointed though that we don't get to learn who Embry's father is. I'm interested to see what you can find out from the Forums. There's definitely a disconnect somewhere. I love the Lexicon and normally trust what they say, but I really think this one is wrong. In Eclipse, Jasper says "I'd been [Maria's] companion for as many years as Carlisle and Edward have been together..." (p. 299). During Eclipse, Carlisle and Edward had been together for about 80 years. It wouldn't make sense for Jasper to have left in 1885, only 20 years after he arrived. I surmise that it was around 1940, which you can also get from the Guide. Additionally on the same page in Eclipse, it says that Peter came back for Jasper five years after he left. On pg. 298, Jasper says that Peter had "survived his first three years, against the odds." This would imply that Peter was turned in the mid-to-late 1930s. In Midnight Sun, it says that Peter was created in the 1940s (p. 165). This is a little off with the Guide and Eclipse's timing, but it seems a lot closer than the Lexicon's timeline. I assume that Stephenie had the timing off in the early draft. Still, I think Peter and Charlotte were both created in the 1930s or so if you look at the books. Your exploration is epic! I'm fangirl squeeing over here. *sighs* So more inconsistencies? I can't believe the screwed up dates carried over to the guide. I'm interested to see if the forum responds to the inquiry. Thanks Alison, you have given me much to consider. I'm kind of sad for Roselie. Is that really all there ever was to her, her Eclipse story? And of course I want to know more about Jasper. I wasn't interested in this before reading this review, I still won't buy it, but I might borrow a friends and flip through it. Am I'm the only book blogger that don't care for this Twilight mess. hmmm. shall return to check out more of your reviews. I read this post on my phone last night, but I couldn't post a comment, so here I am again! I just want to say that I think your knowledge of Twilight is astounding! I'm a big fan of the books, but your background knowledge blew me away! I'll be picking this book up for sure! This post is so awesome! Go Alison! I love the way you broke everything down. I'm not even a big Twilight fan (I like the books, but I'm not in love with them), but you've gotten me so excited. I probably wouldn't even have considered this guide, but now you've made me interested in checking it out. I would love a book about Jasper and Alice pre-Cullens. Especially one that goes into detail about Jasper's life with Maria. I love Twilight, but I didn't really think of getting this... now, though: I really want it! I've always wanted to know more about Alice's human life, and about the vamps that came into the story in Breaking Dawn. Brilliant, brilliant review: love the way you break it all down. I loved the first Twilight book, but it seems each book I read after, I lost a little bit of interest. I would like to read this book, especially after reading your review, I know I would like the added information, but I probably won't get to it soon. I read this (thanks to several back links from your post today (Sept 7) and I am so excited for this book now! I purchased it last week (after much debate) and now I can't wait to finish up my current reads to read this one. Thanks for another fabulous review!